Confidence was the key for the U.S. economy and financial markets in December. U.S. markets ended the year on a high note, with all three major indices up for the month, capping off positive quarterly and annual returns. The Dow Jones Industrial Average led the way with gains of 3.44 percent, 8.66 percent, and 16.50 percent for the month, quarter, and year, respectively. The S&P 500 Index had lower but still strong returns of 1.98 percent, 3.82 percent, and 11.96 percent for the same time frames, while the Nasdaq notched lower gains of 1.19 percent, 1.66 percent, and 8.87 percent for the periods. Technical factors for the three indices remained positive, and all stayed above their respective 200-day moving averages throughout the month. The positive results for the three indices are encouraging and help reinforce the belief that the economy is continuing to expand at a healthy pace. In addition to steady gross domestic product growth, companies resumed earnings growth in the second half of the year. Per FactSet, as of December 30, the estimated fourth-quarter year-over-year earnings growth rate for the S&P 500 stood at 3.2 percent. If actual earnings growth matches estimates, this will represent the first two consecutive quarters of such growth since the first quarter of 2015.
International markets had a more mixed year than their U.S. counterparts. The MSCI EAFE Index was up 3.42 percent in December, but it was down 0.71 percent for the quarter and only notched a modest 1-percent gain for the year. The more volatile MSCI Emerging Markets Index rose slightly in December, 0.29 percent, but was down 4.08 percent for the quarter, despite posting a robust 11.60-percent return for the year. Technicals for international markets were weak in December, with the MSCI EAFE breaking below its 200-day moving average, though it closed out the year above its trend line. The MSCI Emerging Markets measure also spent the latter half of the month below its trend line and finished 2016 there. Going forward, the technical weakness, as well as political and economic concerns in developed and emerging markets, may signify weaker performance for both indices in 2017. Fixed income markets had a turbulent end to 2016. The Bloomberg Barclays U.S. Aggregate Bond Index was up 0.14 percent for the month, lost 2.98 percent for the quarter, and gained just 2.65 percent for the year. The high-yield bond market fared better, with the Bloomberg Barclays U.S. Corporate High Yield Index up 1.85 percent, 1.75 percent, and 17.13 percent for the month, quarter, and year, respectively. The negative performance in the broader fixed income market was largely due to a spike in interest rates following the presidential election, as the yield on the 10-year U.S. Treasury bond went from 1.60 percent at the beginning of the fourth quarter to 2.49 percent by year-end. The increase in yields resulted primarily from increased expectations for inflation going forward and the Federal Reserve’s (Fed) move to hike interest rates in December. For the second year in a row, the Fed raised interest rates in December. This action, combined with forecasts for an additional three rate hikes in 2017, signaled the Federal Open Market Committee’s belief that the economy is strong enough to withstand a gradual normalization of interest rates. This conviction was strengthened by the release of data that continues to indicate improved economic growth. The major source of positive economic news in December came from increased consumer confidence. 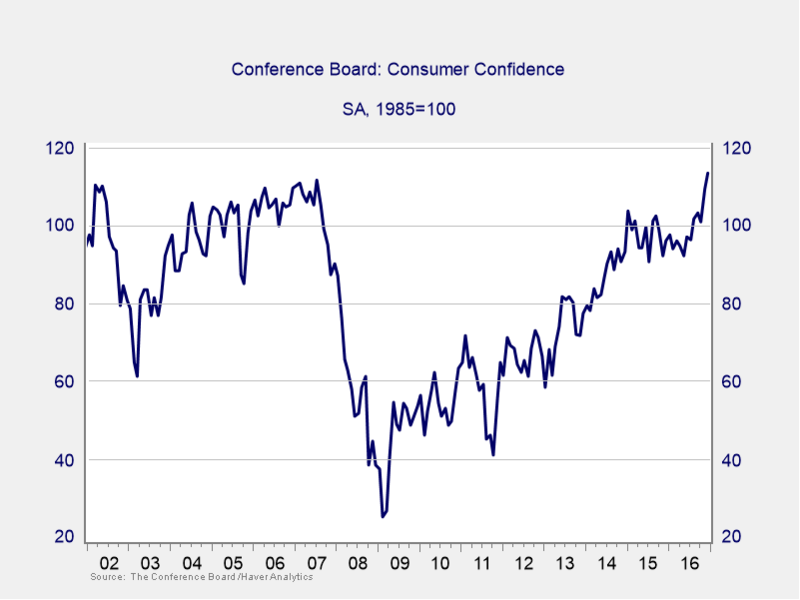 Both major confidence measures rose more than expected during the month, with the Conference Board’s Consumer Confidence Index reaching its highest level since 2001 (see Figure 1). The large uptick in consumer confidence stems mostly from heightened expectations for the future and could bode well for increased spending in 2017. Consumers were not the only ones experiencing increased confidence in December. Core durable goods orders, which serve as a gauge of business confidence and exclude volatile airline orders, were up more than expected in November, indicating that businesses may be starting to invest again. Additionally, the ISM Manufacturing and Non-Manufacturing indices continued to rise even further into expansionary territory. November employment figures, reported in early December, were strong, with a healthy 178,000 jobs added. The headline unemployment rate also dropped to a post-recession low of 4.6 percent. Even though these results were not unexpected, the solid numbers were positive signals for the economy. Housing continued to be a driver of growth. Existing and new home sales increased more than expected, with existing home sales climbing to their highest level since 2007. In addition, builder confidence improved significantly and also reached levels not seen since the mid-2000s. As confidence builds and houses sell, momentum in the housing market will continue to help support overall economic growth. Despite the generally good news, there were some disappointing data points released last month. Personal income growth, personal spending, and retail sales all came in below expectations. Moreover, wage growth declined slightly. Given the big increases in consumer confidence and the low unemployment rate, however, it is quite possible that these less-than-stellar results will end up as only temporary slowdowns. Another weak data point came from industrial production, which decreased more than expected. The large driver of this decline was lower-than-forecast utility production due to unseasonably warm weather. Again, this may just be a slight pause in the ongoing recovery. Heading into 2017, there is a great deal of political uncertainty around the globe. In the U.S., the election of Donald J. Trump and a Republican Congress has catalyzed recent stock market outperformance, as investors anticipate reductions in corporate tax levels and the deregulation of many industries. These expected moves are widely seen as tailwinds for the U.S. economy and have led many economists to increase growth projections for the short term. Against this backdrop is the potential for the renegotiation of existing trade relationships, which could hinder U.S. business. For the time being, however, despite a high degree of uncertainty surrounding exactly what the new Republican-led government will do, markets in the U.S. have reacted positively to the prospect of a Trump administration. Political risk is not limited to the U.S. In Europe, the emerging Italian banking crisis is placing increased pressure on the European Union (EU), and pending elections in France, Germany, and the Netherlands may result in gains by euroskeptic parties. Given the EU’s uneven economic recovery, and the still-ongoing refugee crisis, these strains will likely get worse. In Asia, concerns about China are garnering the most attention. As growth slows in the world’s second-largest economy, questions about China’s ability to continue growing are becoming more urgent. Additionally, as the yuan depreciates, there is a palpable fear that capital flight may be worsening. Escalating tensions with the U.S. will also bear watching in the upcoming year. As has been the case for much of 2016, the U.S. economy continues to expand at a healthy pace with solid underlying fundamentals. Although uncertainty abounds here and abroad, the positive results of the past 12 months seem likely to carry over into the new year. Recent improvements, particularly in consumer confidence, suggest that growth may well accelerate. No doubt there will be much attention given to political events in 2017, and potential risks may become reality, but the U.S. remains one of the most attractive investment destinations worldwide. Consequently, though short-term volatility may occur, the right path for investors is to stay committed to a strategy. A well-diversified portfolio with a time horizon that matches investment goals is typically the best way to achieve desired financial aims. Disclosure: Certain sections of this commentary contain forward-looking statements that are based on our reasonable expectations, estimates, projections, and assumptions. Forward-looking statements are not guarantees of future performance and involve certain risks and uncertainties, which are difficult to predict. Past performance is not indicative of future results. Diversification does not assure a profit or protect against loss in declining markets. All indices are unmanaged and investors cannot invest directly into an index. The Dow Jones Industrial Average is a price-weighted average of 30 actively traded blue-chip stocks. The S&P 500 Index is a broad-based measurement of changes in stock market conditions based on the average performance of 500 widely held common stocks. The Nasdaq Composite Index measures the performance of all issues listed in the Nasdaq Stock Market, except for rights, warrants, units, and convertible debentures. The MSCI EAFE Index is a float-adjusted market capitalization index designed to measure developed market equity performance, excluding the U.S. and Canada. The MSCI Emerging Markets Index is a market capitalization-weighted index composed of companies representative of the market structure of 26 emerging market countries in Europe, Latin America, and the Pacific Basin. It excludes closed markets and those shares in otherwise free markets that are not purchasable by foreigners. The Bloomberg Barclays U.S. Aggregate Bond Index is an unmanaged market value-weighted index representing securities that are SEC-registered, taxable, and dollar-denominated. It covers the U.S. investment-grade fixed-rate bond market, with index components for a combination of the Bloomberg Barclays government and corporate securities, mortgage-backed pass-through securities, and asset-backed securities. The Bloomberg Barclays U.S. Corporate High Yield Index covers the USD-denominated, non-investment-grade, fixed-rate, taxable corporate bond market. Securities are classified as high-yield if the middle rating of Moody’s, Fitch, and S&P is Ba1/BB+/BB+ or below.